Our vacation (and eating marathon) may be long over, but one restaurant still vividly occupies my dreams at night. I didn’t leave my heart in San Francisco. I left it at Flour + Water. 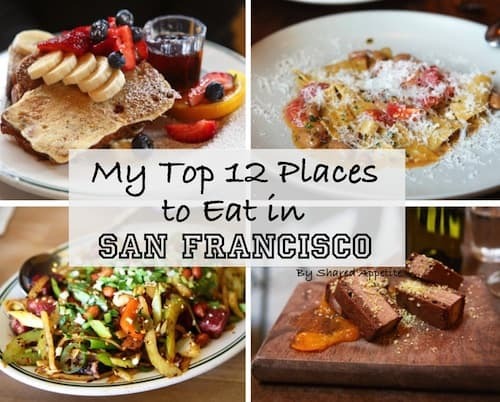 It was, hands down, our favorite meal throughout our culinary journey in San Francisco and Napa Valley. Well, meals, actually. 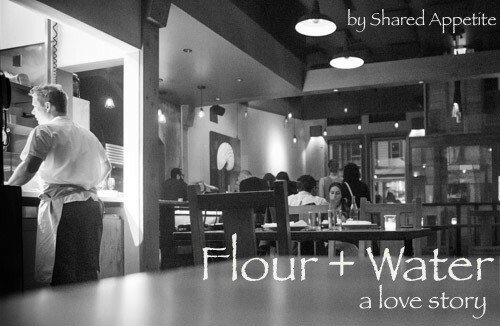 We ended up eating at Flour + Water twice. And we kind of make it a rule not to eat anywhere twice when on vacation, since we want to try as many different places as possible. But honestly, Flour + Water is that good. Our first visit was a late night reservation following an evening tour of Alcatraz. 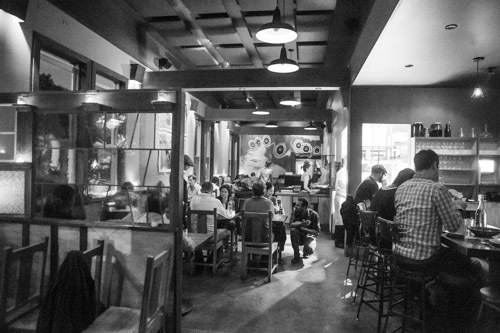 The passionate and inspiring food, energetic neighborhood restaurant atmosphere, and easy-going yet impeccable service immediately prompted us to try to secure another reservation for our final night of vacation right before our flight. They were, not surprisingly, completely booked. But since half of their dining room is left open specifically for walk-ins, Asheley and I were able to score a table by waiting in line a half hour before opening time. The casually dressed service staff are friendly, genuine, and passionate. You can feel the love and excitement they have for the restaurant. 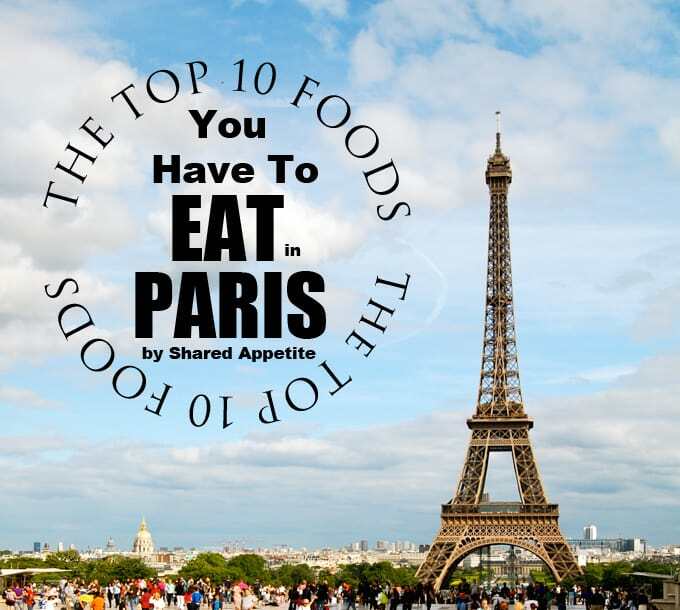 They are beyond knowledgeable about the always evolving food menu and wine list. Our two visits to Flour + Water were within one week of each other and both had changed during that time, which encompasses Executive Chef Thomas McNaughton’s culinary philosophy. Let’s talk about my new culinary hero, shall we? 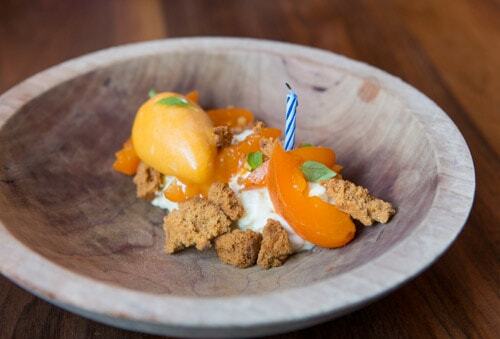 Thomas McNaughton has been a James Beard Rising Star Chef award finalist for the past three years in a row. 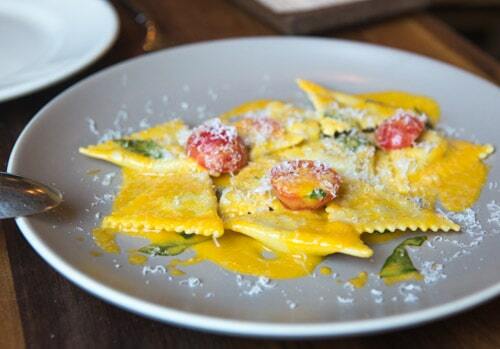 His comfort food menu of pizzas and pastas is wildly original and faultlessly sophisticated. 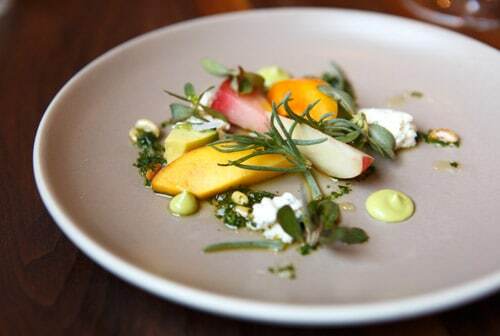 The chef has strong roots to the source of his ingredients, taking care to form relationships with small, local farms. Let’s talk food. The first night we ordered from the a la carte menu, but we decided to go for the ridiculously great deal Pasta Tasting Menu ($65, 7 courses) on our return visit. We were thrilled that this salad of Stone Fruit with Avocado, Salsa Verde, Ricotta, and Pine Nuts was the first course of the pasta tasting. We fell in love with it that first night when it was on the a la carte menu, and was a big reason why we wanted to come back. It was sweet, bright, creamy, rich, and light all at the same time, and definitely one of the best salads I’ve ever had. It’s one of those dishes that you talk about constantly, want to replicate at home desperately, and occupies your best dreams at night. The fresh and light Eggplant Triangoli with Tomato and Basil screamed summer to me, with creamy eggplant and ricotta stuffed pasta enrobed in a simple and clean sweet sungold tomato puree. 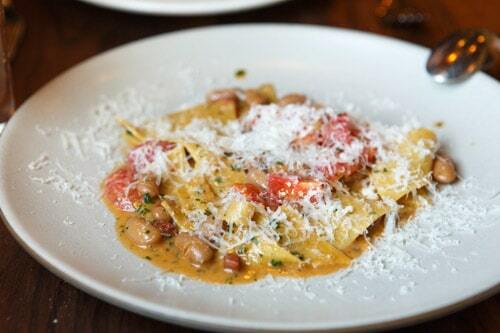 Next up was this Maltagliati with Speck, Cranberry Beans, Rabe, and Cherry Tomatoes. Tasty, although a bit tamer in flavor than the other courses. Now would probably be a good time to mention all the pasta at Flour + Water is made fresh in house and cooked to a perfect al dente every time. Every time. 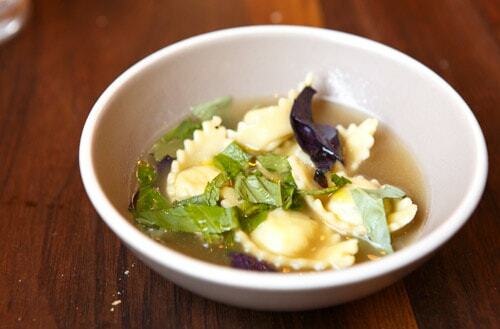 The Halibut Tortellini with Fish Brodo, Fresh Herbs, and Chili Oil was delicate and fresh. 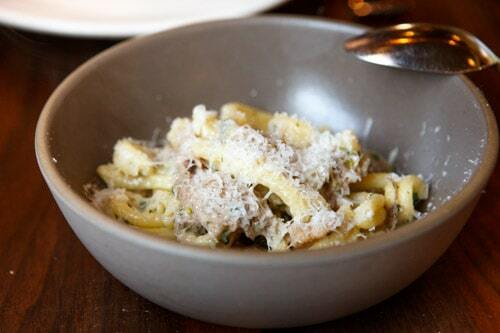 This Strozzapreti with Braised Pork Trotter, Fennel Buds, and Lemon was phenomenal. The meat was super tender, moist, and rich in flavor. And yes, pork trotter is pig’s feet. But that’s not what scared us about the dish. It was actually the fennel. Oh fennel, how Asheley and I absolutely despise you. But not here. Not in this dish. It was used with such a deft hand that the fennel was deliciously subtle. Who knew it could actually be enjoyable?! This Carnaroli Rice Pudding with Stone Fruit, Almond Cake, and Basil, my friends, is one of the top 5 desserts I’ve had of all time. TOP 5. And I’ve had a lot of desserts. A lot. How much did I love this dessert? Let’s just say that after enjoying it as the final course of our pasta tasting menu (and being completely full at this point), I convinced Asheley that we should order another one. Gluttonous? Probably. But I couldn’t leave San Francisco without just one more goodbye. I can’t even begin to explain the perfection within this dish. And I probably shouldn’t even try. Just know… it’s perfect. 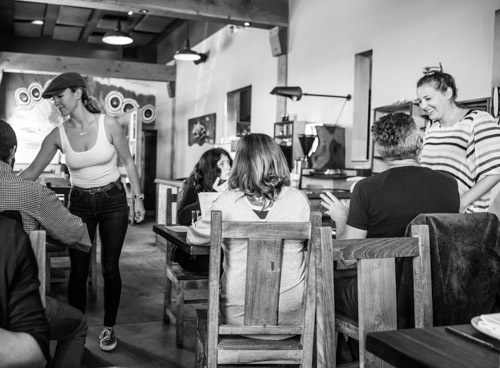 It’s worthy to note that many come to Flour + Water for the wood-fired pizzas, and for good reason. The crust is light and crispy, with just the right amount of chew. We tried and loved the margherita pizza. 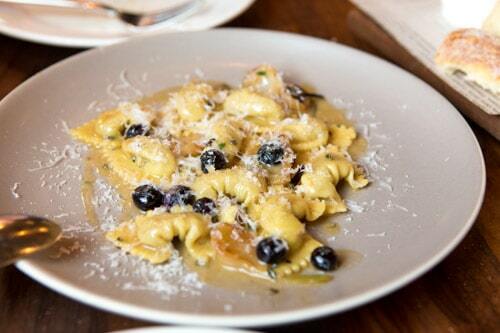 The pastas, though, are in my opinion the gem of this always-packed neighborhood restaurant. 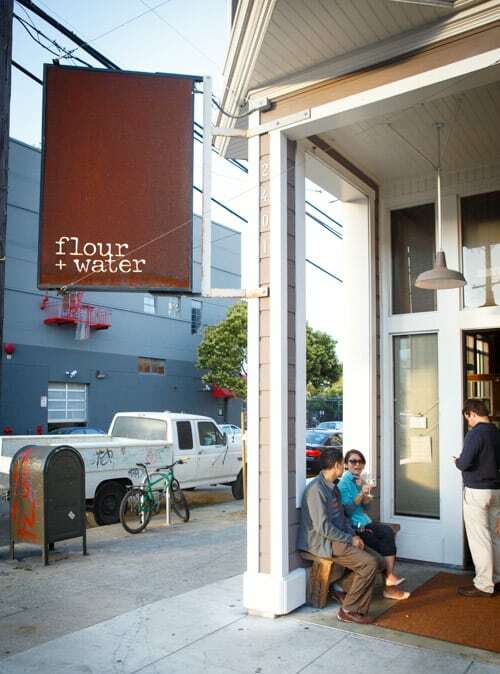 If you are ever remotely close to San Francisco, Flour + Water is a must. Love the bowl they served that beautiful rice pudding in.